***HUGE SALE FOR MARCH AND APRIL *** $102 PER NIGHT !!! Look no further, here is your Alaskan dream come to life. But don't worry, you are not sacrificing technology for the rustic life. This superb home comes with fast WIFI, 50" 4K UHD TV with Sling TV, movie channels, Hulu, Netflix and all your favorite subscriptions to view your favorite shows. 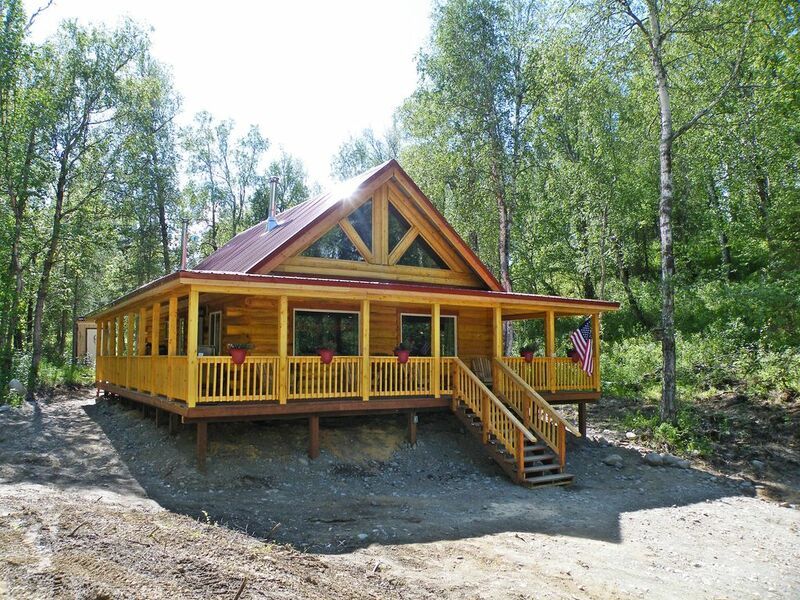 The Twin Hills Log Cabin has just been finished so you can be among the first to stay and realize your Alaska dream of living in a genuine log cabin. Construction is by a family run Alaskan log business. Imagine watching the Moose stroll by from the comfort and privacy of your own large wraparound porch. Wake up to nothing but the sounds of nature and the beating of your own heart. This gorgeous home has 2 bedrooms, 1 bath. The large bathroom has full laundry facilities with new LG HE Washer and Dryer. The King Loft suite affords views but with the privacy of blackout curtains and cellular shades and has a TV with Roku. Upstairs is also an office area for privacy to conduct business, read or just catch up on your emails. There is a superb kitchen with full size appliances, a large great room with gorgeous ceramic wood stove. Bluetooth speaker, radiant in-floor heating. free nationwide telephone calls on us. Grill your catch of the day out on the porch on the BBQ Grill, relax on the Adirondack Chairs sipping a glass of wine. The cabin sits on an extremely private 1.5 acres of wooded beauty. Located in a private lake community and only a few minutes stroll to the lake where you can fish, swim or just relax by the water's edge. The cabin sleeps 6 comfortably. Unlike some vacation homes that are situated in primarily tourist areas, this cabin is located in a peaceful lake community inhabited by locals. You will have the unique opportunity to enjoy Alaska like an Alaskan. There is simply nothing like a true log cabin experience. There is a fantastic calming effect you will feel as you walk through the door. Log homes are living breathing things and you truly feel at home and relaxed here. You will enjoy the best nights sleep of your life, no noise and you can literally hear a pin drop. The bathroom is oversized with full size tub/shower, hickory vanity and commode. There is also a full size washer and dryer with space to iron and hang clothes. We also supply emergency supplies in case you forget your toothbrush, toothpaste, soap, shampoo and conditioner. We also supply laundry supplies, detergent etc. Radiant In-floor heating ensures the cabin stays evenly warm throughout with no cold spots and also no dust blowing around so great for allergies. Very reliable fast wifi available throughout the cabin. You will find a beautiful mahogany quad fire ceramic wood stove. Perfect for those chilly nights when you want to stay in. Has easy side door loading. Firewood is sometimes available. Large open great room with huge ceiling fan and cathedral ceilings with gorgeous large windows. You will find spices, Reynolds Wrap, Glad Wrap and (sometimes) coffee, tea, sugar. Often guests don't want to discard items so we encourage folks to leave non-perishables for the next guests. All kitchen utensils are supplied for you including cookware, toaster, electric kettle, coffee maker, cutlery, paper towel, we even supply spices, aluminum foil and cling film. There is a nice dining room area that comfortably seats six. 50 inch 4k UHD Flat Screen. Sling TV has dozens of channels including HBO and several other movie channels. Using our Roku you can access all your streaming subscriptions too. We keep a small library of books. Enjoy the upstairs sitting room and lose yourself in a good read. We have plenty of board games, perfect for rainy days or just fun with family and friends. We provided a library of movies, perfect for when you want to lounge at the cabin. Something for everyone from kids to grown ups. There are two golf courses within 15 minutes in Palmer. Both are situated in the most glorious scenic locations surrounded by mountains. Perfect for honeymooners and families. Get away from it all or enjoy all that the area offers. You can be as busy or quiet as you wish. My husband and I had a great weekend here. The cabin is a wonderful escape from the city and we spent a few days enjoying nature, each other's company, and our books. It was refreshing. The owners are wonderful with communication and the rental has everything you need. And a fireplace that we now want in our own house! Very comfortable accommodations. Clean and modern. VERY nice, well maintained cabin. Peaceful and quiet yet not so isolated you are concerned. Absolutely perfect for my wife and I. The ONLY downside is the bathroom is downstairs with the master up. Fully functional kitchen, but assume no supplies. We had to buy virtually everything for 2 weeks worth of cooking. Owners are great. and very helpful with whatever you need. I would definitely go back! We stayed at Kay and Kelly's cabin from June 9th to June 15th, 2018. It was perfect!! I would highly recommend this cabin to anyone. Loved the layout, all the windows, and especially the porch where I spent time each morning enjoying the cool Alaskan air. It was quiet and secluded and a wonderful place to come "home" to at the end of an activity-filled day, and also a great place to just to hang out and relax. The drive up to the cabin affords spectacular mountain views. While we could not see mountains from the cabin due to the lush trees; we could see mountain tops as soon as we stepped out on the road in front of the cabin. The location is perfect as there is much to see and do close to the cabin as well as good day trip opportunities within a 2 to 3 hour drive. Our vacation to Alaska was outstanding, and it was made even better by our stay at the cabin. Also, it was a welcome break from the heat of a southeast Texas summer. I have staid at many cabin rentals and this is by far the most superior of my experience. The owners put a lot of care and thought into making the cabin comfortable and cozy, it felt like a home away from home. The home is just as nice as the pictures show and was clean as can be when we arrived. There was nothing we needed or wanted that was not already there. We had an issue with the TV so I sent an email to Kay letting her know we had a problem. Within 30 seconds the cabin phone rang and within 4 minutes she had fixed the problem remotely . Yes, I said seconds...not minutes! The porch was perfect for drinking our morning coffee and relaxing after a day of running around. Cabin is close to two Golf Courses, skiing in winter, Musk Ox and Reindeer Farms. Grocery shopping is only minutes away with two large supermarkets and variety stores. restaurants, bars and local vendors also within ten minutes drive. Big Box stores are only 20 minutes by car in downtown Wasilla.